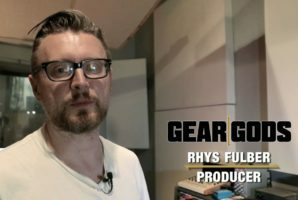 Autumns Eyes is a one-man band, and that one man in Daniel Mitchell, and in this episode of Rigged, he takes us on a tour of his studio gear and guitar collection, used to record his new album Ending Life Slowly, out now. Mitchell is no stranger to the darker side of creativity, and crafts music free of constraints or label interference. Ending Life Slowly strikes a balance between somber reflections on mortality and full-force screaming metal, with cover art to reflect the album’s dreary nature crafted by Indonesian artist Sorrow Grips (Gojira). “This atmosphere is what fueled the writing process for Ending Life Slowly, with death and decay surrounding every element of each track. It’s a cliche topic to write about in heavy metal music, but my approach here was focused more on the immense weight death can hold over one’s shoulders. To sit an truly contemplate what it means for all things to come to an end was a sobering experience to say the least.